Anyone who visits Jerusalem Mill Village during our regular weekend living history programs, summer concerts, and special events, or even when Nature is the only thing going on, can see the results of that outstanding effort. But they may not realize that it takes hundreds of pairs of hands, thousands of hours of planning, and tens of thousands of fundraised dollars annually to turn intent into reality. Here’s the best part—everything our visitors see and enjoy is accomplished by volunteers. The descriptions of Joan’s work are necessarily brief, but if we assigned a dollar value to everything she does for FOJM, we’d easily prove that she’s worth a million. In fact, that’s how we feel about all of our volunteers, regardless of their level of commitment. It all adds up! Oh, wait, there’s more! FOJM received a Governor’s Volunteer Service Certificate for years of participation in the Adopt-A-Highway Program. Maybe you’ve seen our signs along Route 152 near Jerusalem Road. Our next Adopt-A-Highway pickup happens in October. Call 410-877-0080 if you want to join our group of intrepid trash picker-uppers. It’s fun! See more pictures of the Historic Preservation Commission award ceremony. 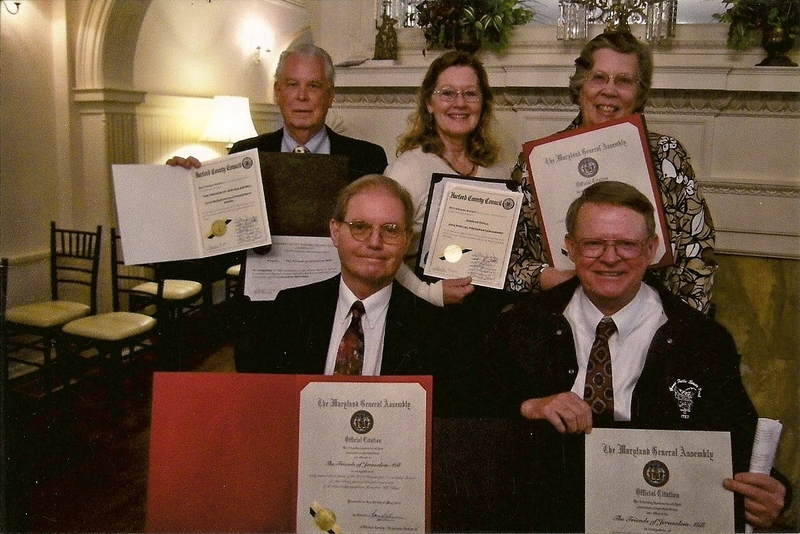 Learn more about the Governor’s Service awards.